← Authors for Grenfell Tower – An Online Auction: Bid on a Signed Copy of TAFAIC! Lauren to Voice a Vampire in Vampirina! It’s finally official, Lauren will lend her voice to Disney Junior’s Vampirina! The show follows a young vampire girl, Vampirina, who learns to adjust to city life after her family moves from Transylvania to Pennsylvania. 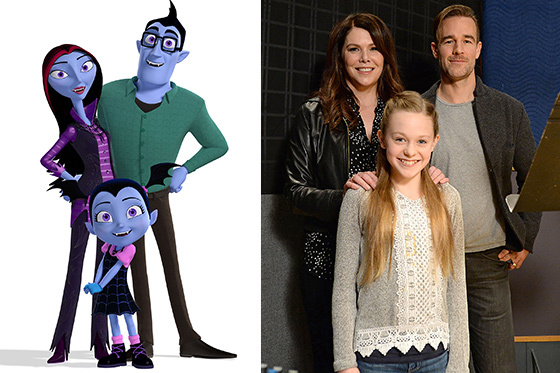 Lauren will play Vampirina’s mother Oxana Hauntly, opposite James Van Der Beek (Dawson’s Creek) as her husband Boris. Their characters will run a bed and breakfast for visiting ghouls and goblins. Set in an urban Pennsylvania neighborhood, Vampirina is centered around Vee as she settles into her new surroundings, including making friends and attending a new school. Excited to experience everything that the human world has to offer, Vee will learn that while it may be easier to blend in with her peers, it’s important to celebrate the differences that make everyone unique. Always by her side, Vee’s mom and dad are also adapting to their new life as proprietors of the local Scare B&B, a bed and breakfast for visiting ghouls and goblins. Patti LuPone and Brian Stokes Mitchell are also part of the cast as Vee’s grandparents, Nanpire and Grandpop, while Wanda Sykes voices Vampirina’s cantankerous yet loyal gargoyle sidekick Gregoria. The show premieres on Disney Junior this fall. The dancing… dear God the dancing.